Crush: First Love Anthology: Call for Submissions! Crush: First Love, New Talent is a showcase for comics creators who have not yet been published in a widely circulated print publication. If you have a CV with a long list of recent published works, this project is most likely not for you. Crush: First Love, New Talent is committed to the inclusion of comics creators of color and emerging LGBTQAIU identities as a priority. Crush: First Love, New Talent will pay a base $25.00 per page rate to all contributing creative teams. This rate is subject to possible increase should the Kickstarter campaign exceed its initial goal. Story contributors will also receive two comp copies of the finished book. This anthology will be a paperback book. We have not yet decided whether the interiors will be color or black and white. Exact page and file specifications to be announced concurrently with the final roster of creators. Print size will be 7” x 10”. We are looking for stories of 10 pages or less. Exceptions to this length requirement will only be made upon approval from the editors. If you are interested in contributing, please send some sample finished artwork and a story proposal of one or two paragraphs long to editor@stackeddeckpress.com. The open call for submissions ends November 22nd, 2018. The final roster of contributing creators will be announced in early January 2019. We will launch Crush: First Love, New Talent at a party in the city of West Hollywood, CA pending publication. (Venue to be announced.) We look forward to seeing the work and perspectives of a new generation of LGBTQAIU comics creators! Thank you in advance for your interest! SDP Happenings for February 2018! In February, Stacked Deck Press continues a busy 2018 with shows in California and the Midwest! Come See Tara at AnaCon 2018! 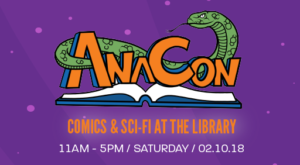 This Saturday, February 10th at the Anaheim Public Library SDP will be at AnaCon! Come visit and see Tara for your favorite SDP titles as well as one-of-kind artist trading cards and original sketches made to order! This event is FREE! So those of you in the greater Los Angeles/Orange County area have no excuse not to come! SDP Joins Prism Comics at Planet Comicon Kansas City 2018! Four the fourth consecutive year, Prism Comics will be exhibiting at Planet Comicon Kansas City! Stacked Deck Press will be joining Prism again this year at their table in Artist Alley this February 16th through 18th at Bartle Hall! Come get your fave Prism and SDP titles ATC’s and sketches-to-order from Tara! Saturday Feburary 17th at 2:00 PM, don’t miss the panel discussion, Out in Comics, featuring Tara, Marshall Edwards, Christianne Benedict, Max Dlabick, and Kirsten Steitz! SDP Happenings for January 2018! Stacked Deck Press has a big year planned for 2018, and we’re kicking off with a January full of events and new releases! Come see Tara at Cos-losseum-San Diego 2018! Come to Cos-Losseum San Diego this January 6th and get your favorite SDP titles! Tara will be signing books and selling sketches. Proceeds from the show benefit the Lupus Foundation of Southern California, so come out for a good time and a good cause! SDP makes its first appearance at the Hemet Library Comic-On! Come to the Hemet Public Library this January 13th! Tara will be selling sketches and all the SDP titles at this very special community comics show! We’ll also be offering the first issue of a brand new title, Lipu Sitelen! The show is free to library card holders. For those without a library card it’s $3.00 at the door. Support comics literacy in your community! SDP’s Tara Avery and Sonya Saturday will be at Pasadena Comic-Con! This January 28th, come see Tara and Sonya as they promote new titles! Tara will be offering SDP’s latest The Complete Gooch, compiling the full run of the popular bisexual-themed webcomic, including bonus material and an all new cover! Sonya will have a variety of brand new prints and publications showcasing her naughty, yet nice sense of humor! SDP’s ALPHABET Nominated for a 2017 Lambda Literary Award! We at SDP would like to thank editor Jon Macy and all of our wonderful contributing comics creators for making this publication a success! Extra special thanks for all of the Kickstarter backers who took this project from dream to reality! If you have not yet purchased your copy of ALPHABET of you can purchase it here on our website or at Prism Comics’ site. Remember, partial proceeds from every sale go to benefit the Prism Comics Queer Press Grant!